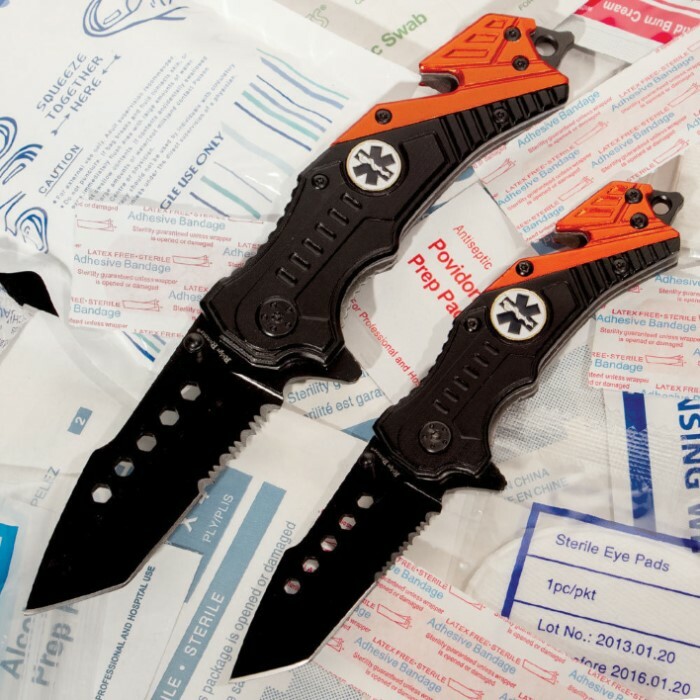 Double down on your rescue efforts with this two-piece EMT Assisted-Opening Rescue Knife set. You get a large and small version, each featuring a partially serrated tanto point stainless steel blade with a fast assisted-opening mechanism. The anodized aluminum handles house a pocket clip, seat belt cutter and glass-breaking spike on the end. I am a fire Dpt Cadet so I needed a nice knife for cutting rope and other related things. The knife came with a nice edge right out of the box witch was great. 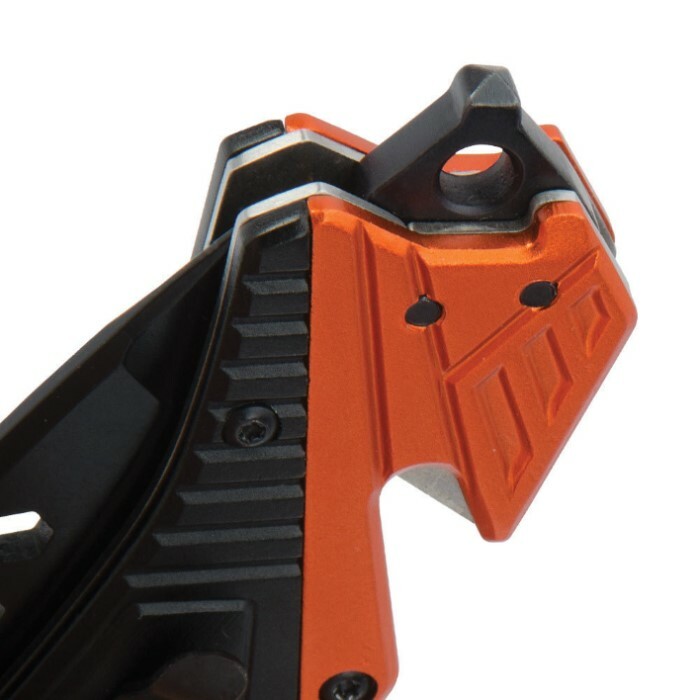 The pocket clip slips on easily and securely holds it until needed, I am nicely impressed with it. 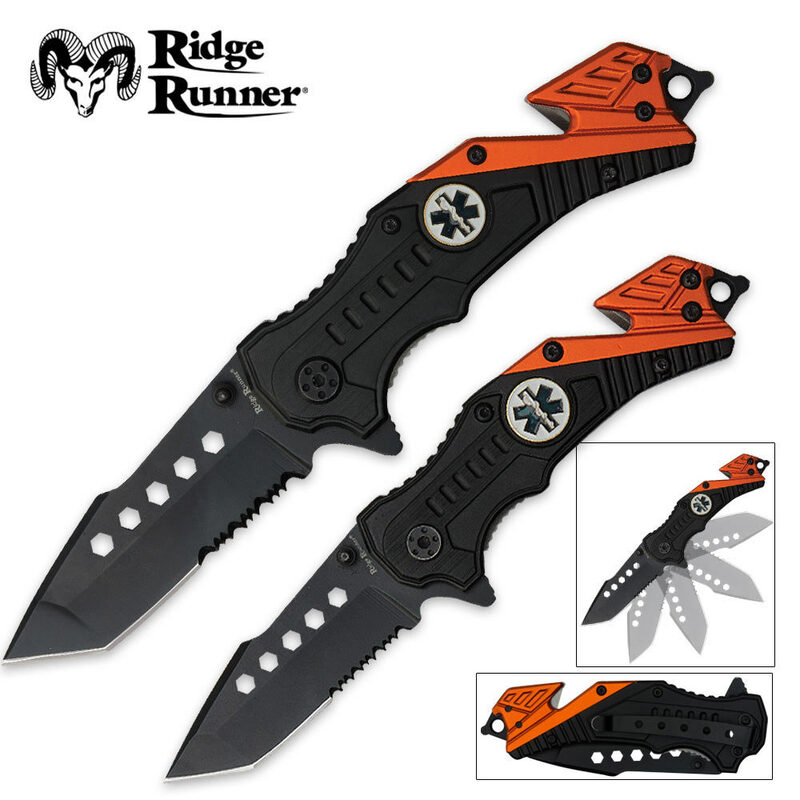 Over all the two knives are great for the price and the EMT symbol is a really nice bonus. The action on these are hit and miss. I'm hoping they loosen up over time. Holds a nice edge and they arrive fairly sharp. If you are looking to have an extra to keep in the truck this one is hard to beat. These two knives are constructed of thick, well put together steel. They look really nice and seem to function just as well! Ive bought three sets, and ive already given away two. Excellent quality, and very handy. I would reccomend these knives to EVERYONE! hi, i'm highly trained to help people & have used this knife for rescue & cutting rope, wire, wood etc. lost last one, bought 3 set's, my 1st aid teacher liked so I gave it to her, pulled another new one out of the box for me, have one left. way excellent for the price. "If you are considering buying this, just do it." This is a great deal for just one knife and you get two. This is part of my EDC. They are razor sharp, easy open, and there is nothing bad to say about it, just buy it.